Poor Willow had an eye surgery not long ago, but what’s everyone else’s excuse? Sometimes Milton doesn’t move all day. 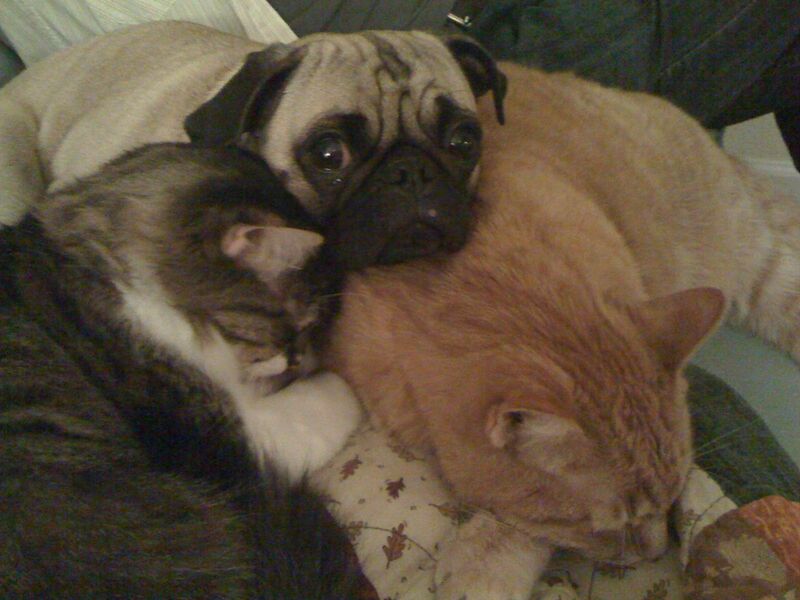 At least they are all getting along. Yep, it’s been a while. We’ve been busy enjoying the spring. It’s been one of the nicest I remember. Unfortunately we haven’t been able to let Diego run around out in his backyard too much lately. We’ve been doing a lot of work back there, and we have an evil Chinaberry tree hanging over our fence from the neighbor’s yard that decided to drop chinaberries all over our yard all spring. They are mostly gone now, but that doesn’t help us much because it’s starting to get warm/hot out. Poor Diego. 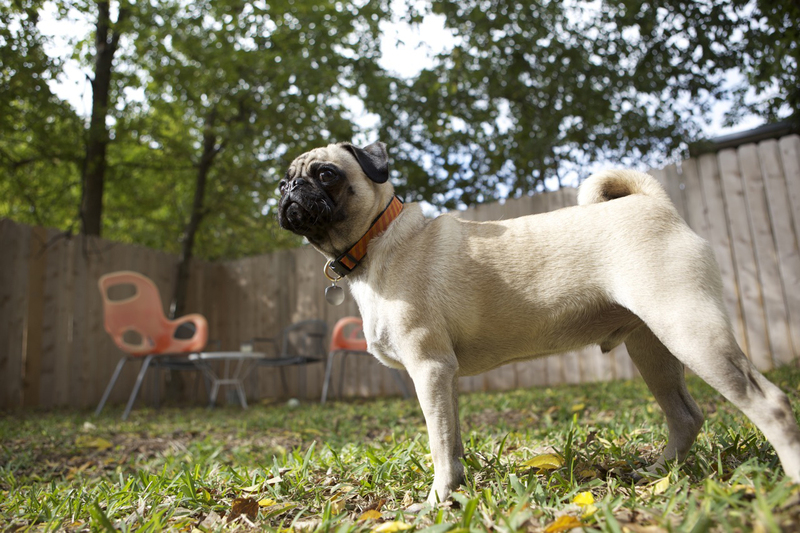 During the nicest pug weather, he’s been kept out of the yard. We are hoping that at some point we’ll be able to convince our neighbors to chop the tree down since it’s really just a glorified (humongous) weed anyway. We’ll keep you posted on that situation. Stay tuned for summer updates from Diego. We plan on getting out and doing as much fun stuff as we can this summer. 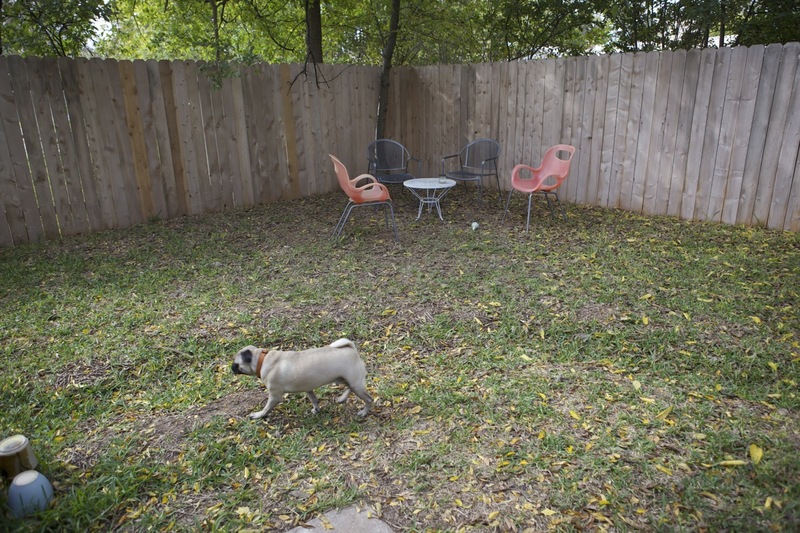 We never thought it would happen, but we finally have a yard for Diego to play in. We closed on our condo at the end of the summer, and we’re happy to say that Diego and the cats have been enjoying the new place. Moving was an interesting experience. Everyone got a bit confused and stressed, but in the end it was all for the better. 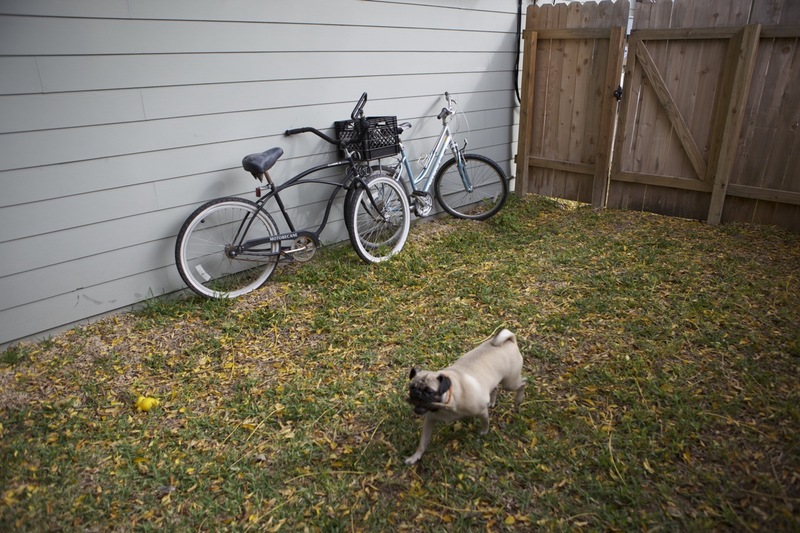 We were lucky to find a condo with so much outdoor space, not only for Diego, but for us as well. We love to spend evenings sitting out under the trees, reading or just hanging out with a glass of wine. Now we just need to start landscaping. We’re thinking of adding some nice native plants, and some climbing plants as well. It was a crazy busy summer, but somehow we all managed through it. We’re looking forward to the holidays and we’re glad we got our backyard in time to enjoy the cooler weather that we waited so long for. Diego is as silly and crazy as ever, but now at least he has some space to run around and get out some of his lingering puppy energy. 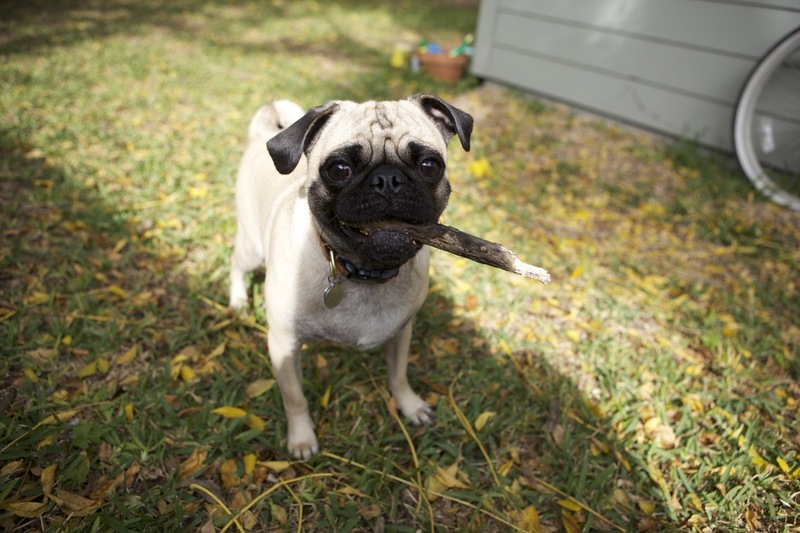 He loves to chase leaves and chew on sticks. I’d tell him he’s a cliche if it weren’t so freaking cute. It’s been a very busy year for us, but we’re ready to start posting again. 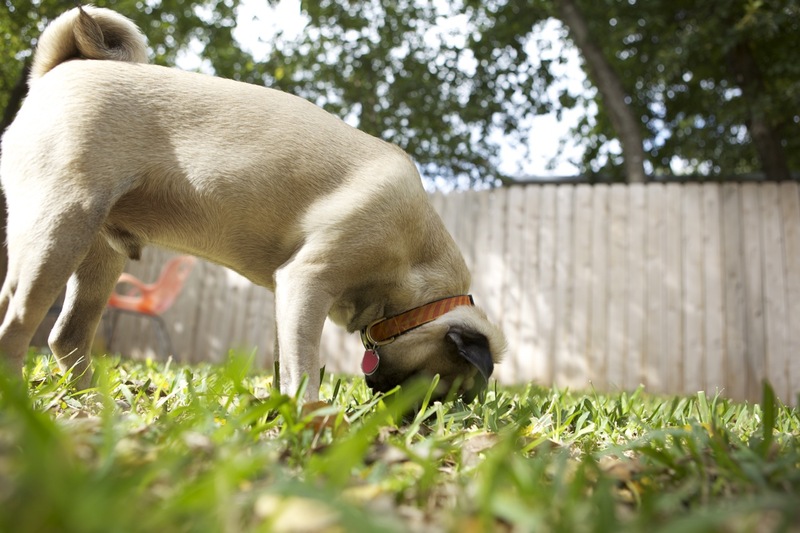 We moved a couple of months ago, and Diego’s ready to show off his new digs…and his YARD. He’s super happy and excited and we’ll have some pictures up soon. Hope you all had a great summer! Diego has been rowdier then usual lately. He wants to play with the cats way more then they want to play with him. Even Fork is getting tired of him. 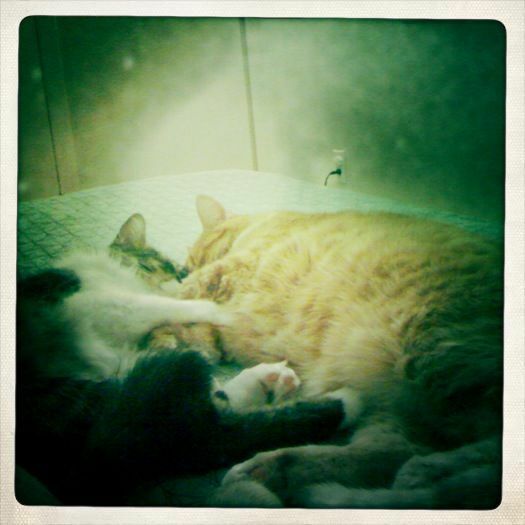 Diego and Fork will spend a small amount of time chasing each other around, and then playing on the bed. That’s all fine and good until Fork gets tired of it, and Diego doesn’t get the hint. He doesn’t know when to stop, and usually ends up bitten in the face by Fork. Of course, he doesn’t learn from this either because he keeps coming back for more. Our new plan is just to break them up in the beginning when they are still playing. If you can’t play nice, you can’t play at all. It’s harder then you would think. I feel bad for Diego every time I hear him yelp from being bitten, but then again, I can’t believe he keeps doing it. We’ve been trying to get him out for more walks, but that ends up being William’s job because my allergies are kicking right now, and I can’t really be out for much longer then 10 minutes. By the time my allergies go away, it’s going to be time for the heat to start. I just can’t win. We’ve also started looking into doggie daycares. We are thinking about getting him in possibly once a week, or a couple of times a month. Especially days when we are working all day, and also have plans at night. We just can’t leave him in his crate that long. It’s just not right. the cats discussing what to do with the bratty dog. 50 hours in a car (round trip) with a dog. Pretty fun. Actually, Diego did really well. Aside from crying every time the car stopped. We all got to spend quality time with family that we never get to see. Grandma and Grandpa, and aunts and uncles and cousins. Good times! Diego bugged us to go to Dollywood, but we only drove up the street so he could see it. 50 bucks a ticket is pretty steep! I think he appreciated the effort all the same. All in all, it was a great, RELAXING time, and the kitties got a Diego break at home, filled with lots of visitors. Every day Fork and Diego have an awesome chase/wrestling match. Fork usually wins. They start with Diego harrassing Fork, and then go into some great chases, and usually end with Fork biting Diego. Diego seems to get pretty worked up, and Fork is super chill. It’s pretty funny to watch, but can be hard on the ears at times. It’s all play, and no one ever gets hurt. Luckily for Diego Fork wear soft claws, or he could accidentally take an eye out. The only time bearable outside is in the morning or evening. We don’t let the cats out most of the time, but sometimes they get a treat and are allowed to go outside to roll around on the front porch. This seems to work out well because eventually they seem to get freaked out and want to go back in anyways. It makes me feel better knowing that they are not dying to go outside all the time. Once we accidentally left Fork outside for a few hours, and we found him crouched under the table on the porch, wanting to come back in desperately. Diego likes to go out there too. We’ll take him for an occasional walk here and there early in the morning if it’s cool enough, but it is usually really early because it heats up fast. So we also get out on the front porch to hang out in short spurts. We know that we can duck inside when we see the tongue come out he really starts to pant. I feel so bad for him, because he loves to be outside. We are counting down the days until it cools down and we can start going on walks again. Yay! Holidays are for resting. We really need a break around here, so we’re going to take it easy this weekend. 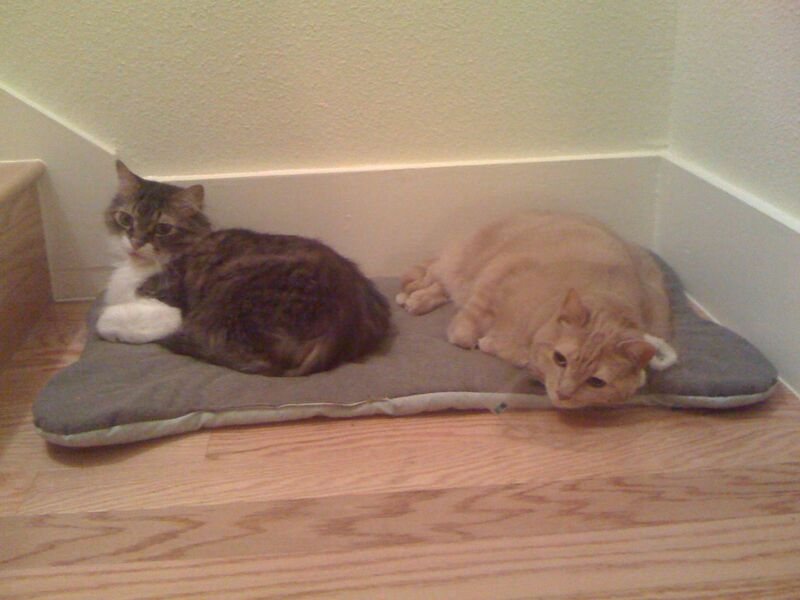 Of course the cats and Diego take it pretty easy most days. They pull their weight by lovin’ on us. They are our therapy when we come home from working long hours. We almost don’t know what to do with ourselves! It feels like we’ve been on the go for months. We’re definitely looking forward to more of this. 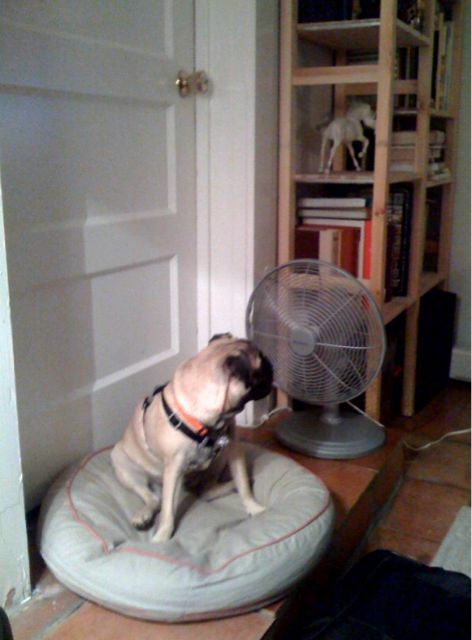 Pugs and heat just don’t mix well. I think that’s a well known fact. Living in an extra warm climate may not be great idea, but we manage to get by. InternetSite on gearing up for summer? لینوکس on gearing up for summer? loans without collat… on gearing up for summer?